It`s been a few weeks since South Korea‘s capitol Seoul was all about fashion during Seoul Fashion Week Spring 2019. But in fact, here in Seoul it seems to always be about fashion as Koreans are very stylish, trend oriented and fashion interested. 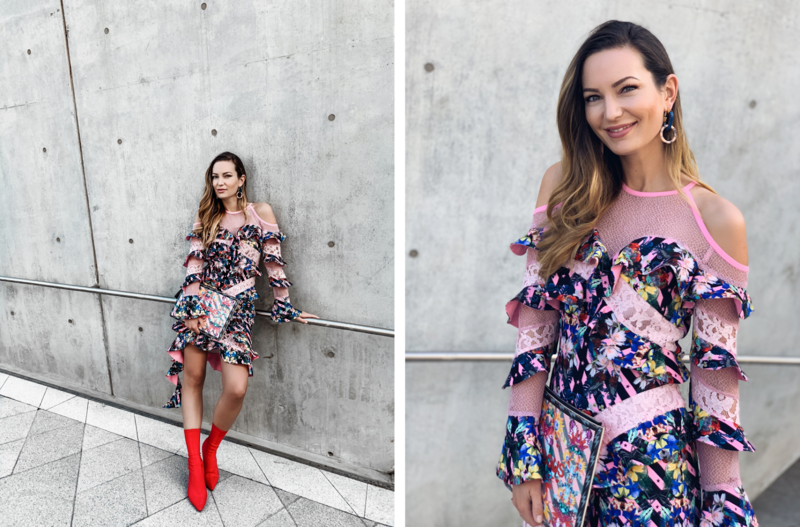 When I first came to Seoul earlier this year to do apartment hunting, I already had the chance to take a glimpse into Seoul’s Fashion Week in spring as it took place in the same week when I was here (take a look at my outfit here). I only had little time but didn’t want to miss it. So I went the Dongdaemun Plaza (DDP), where SFW (Seoul Fashion Week) takes place and instantly became overwhelmed with all the street styles I found there. I inmediately knew: Seoul Fashion Week is something special! The creativity and fashion sense that people showed with their styles and outfits were simply amazing. So obviously, when I got invited from the designers to see their shows during SFW this fall I became completely excited. As I knew that the attandees are going to dress bold and striking, I decided to play with some styles as well and opted for some outfits that I really loved. My first look was an all-leopard look in yellow and black combined with flats as I knew I was going to run around a lot. This outfit got some attention and I were asked by many people to take pictures and street style photographers took their shots. 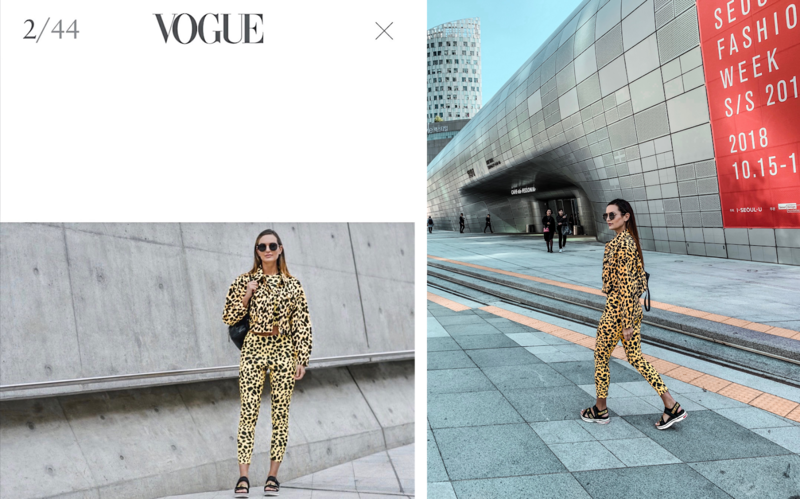 As you might have already seen on my Instagram, I ended up being featured by American VOGUE magazine for best street style during Seoul Fashion Week. I would have never expected that and feel grateful and honored. I also met a German reporter for Germany’s most leading news magazine SPIEGEL online. She did an interview with me and wrote an article about it that you can read here. I had such a great time with her discussing Koreans fashion culture and taking her into my little fashion week jungle. For my second look I decided to wear an all-neon look as neon made a big comeback this year and I love a little color some time. I wore an orange one-piece with a padded neon coat. I was happy that I had this coat on because it got a little chill during this day and I would have freezed without it. My next look is a beautiful pink dress from Greedilous. The designer herself invited me before SFW to her showroom to pick an outfit to wear for her show. It was the first time for me that a designer dressed me for a show and it was very exciting to see in what kind of style she sees me. We decided on a girly but classy dress with some fringe details that I combined with red heels. On my last day of SFW I wore cycling shorts with a black leather harness skirt, a tweeded blazer and a beret hat. On this day I got to meet a German content creator that I filmed a little video with. I’ll keep you posted for this one! All in all, Seoul Fashion Week Spring 2019 has been very exciting for me. 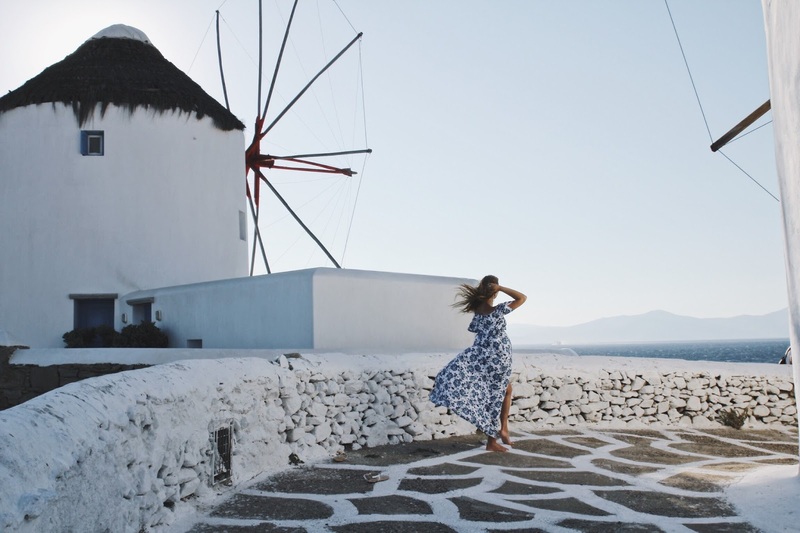 Many things were different from what I was used to from European Fashion Weeks. Seeing Koreans pop culture interfering with Seoul Fashion Week as many K-Pop stars attented the shows and the front rows were always filled with flashing lights from the Paparazzis or all the kids dressed in completely designer outfits and posing for the street style photographers. But the best part was that I got to meet so many interesting and kind people that makes me already excited for the next Seoul Fashion Week season.